When you are applying for jobs, employers want to see what skills you have even if you don’t have paid work experience. What kinds of skills can you include on your resume if you’re a high school student? Here are examples of the different types of skills students can use on their resumes, as well as in cover letters and job interviews. You’ll also find tips on how to include these skills in your job materials. Your resume can include skills that you have learned in school, in extracurricular activities, in sports, and in volunteering. For example, if you have played football, soccer, basketball, or other sports, you have teamwork skills. Were you the captain? You have leadership skills. Have you taken a computer class or taught yourself how to use software programs? You have computer skills. Almost everyone has some level of communication skills. If you can carry on a conversation, present in class, or write a paper for school, you are communicating. When you have successfully juggled personal activities and schoolwork, you’re flexible and dependable. Did you work on a group project? You have collaboration skills. Do you babysit or mow a neighbor’s lawn? You are reliable and dependable. Below are five skills that almost every high school student has, and that almost every employer is looking for. You’ll also find related keyword phrases that you can use in your resume and cover letter. Communication is a skill that refers to your ability to both convey information to others and to listen. This skill includes oral and written communication. Every student has some experience developing his or her communication skills. Have you given any class speeches or presentations? Then you have improved your oral communication skills. Have you taken any courses involving writing? Ditto. Employers are always looking for employees with strong written and oral communication skills, so be sure to emphasize your communication experiences. Related resume keywords: Customer service, friendly, good listener, guest services, presentation, reading, verbal communication, writing, written communications. Dependability/Responsible Employers seek teenagers who are mature and whom they can rely on to show up on time and get the job done. Emphasize your responsible nature. Have there been times when you were given additional responsibilities (in work, school, or even sports) due to your dependable character? Include examples of these in your job application. Related resume keywords: Flexible, follow instructions, hard-working, multitasking, organized, punctual, reliable, responsible. Employers typically don’t expect high school students to know all the skills they need for a job right away. However, they will expect you to pick up new skills quickly. Emphasize times in the past that you picked up on a new skill or technique with ease. Related resume keywords: Accuracy, energetic, enthusiastic, fast worker, initiative, innovative, learn quickly, research, willing to learn. 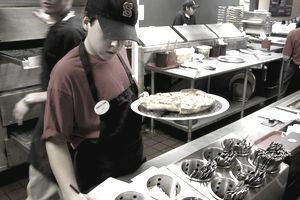 Teamwork Many jobs for high school students involve working on a team, whether as part of the wait staff for a restaurant or as a co-counselor at a summer camp. Include in your resume examples of times that you worked well as part of a team, such as a sports team, club, or music group. Related resume keywords: Cheerfulness, collaboration, courteous, helpful, interpersonal, leadership, positive attitude, role model. Employers are always happy to hire employees who are good with technology. Luckily, many high school students have that skill set. If you have any experience (either in school or through extracurricular activities) working on particular computer programs, or doing any other technology-related activities, include these. If you have a lot of these experiences, you might even create a “Technology Skills” section on your resume. Related resume keywords: Computer, math, Microsoft Office, social media. Make a list of what you have done in all your school and non-school activities, along with the skills you have learned or used in each of those roles. Include those that are the closest match for what the company is seeking on your resume. For example, if you’re applying for a job in a retail store, the hiring manager will be interested in knowing that you are dependable, reliable, accurate, and have interpersonal and communication skills. For a part-time job where the schedule varies, you will need to be flexible and able to work a variety of different hours. A good way to find the skills you need for a job is to review the job requirements listed in the job posting. In many cases, it will be easy to determine what skills you need to be considered for the job. We're looking for hard-working, enthusiastic individuals who want to be a part of a winning team. If you enjoy working with people and love to learn new things, we want to meet you. We offer flexible schedules and the opportunity to advance within our restaurants. Ability to understand and carry out oral and written instructions and request clarification when needed. Qualified customer service reps with personality and people skills. You will find the required skills and qualifications listed in the job posting for most jobs listed online. If they aren’t listed, review the requirements for similar jobs to help generate a list of applicable skills. Recruited club members using school newspaper, website, Facebook, Twitter, and school Clubs Day. Composed a weekly email newsletter to club members. Designed and led weekly arts and crafts activities for 15 club members. This is an example of how to include skills in a high schooler's resume. Download the resume template (compatible with Google Docs and Word Online) or see below for more examples. Deeply responsible and dependable high school student positioned to excel in Summer Camp Counselor role requiring enthusiasm, creativity, teamwork, and a dedication to student welfare and success. Sports / Athletics: Experienced in coaching and teaching the basics of basketball, swimming, and volleyball to children ages 5 through 13. Hold current First Aid, CPR, and Lifeguard certifications. Communication and Teamwork: Engaging interpersonal skills in working with students to identify their strengths and challenges, motivate participation, and create positive learning environments. Event Coordination: Display effective organizational and leadership skills in coordinating fundraising events, sports tournaments, and games. Additional Skills: Quick learner, proactively observing processes to swiftly gain mastery of new skills and techniques. Technical proficiencies include MS Office Suite and social media. Serve as volunteer coach for boys’ and girls’ youth basketball and volleyball teams. Demonstrate gameplay and ball handling techniques, assign positions, and communicate with parents / caregivers. Officiate as needed at basketball games. Helped to organize and publicize well-attended seasonal tournaments. Suggested and implemented outreach program at public schools to attract new program participants. Enthusiastically recruited over 100 fellow high school students to participate in annual 5K race fundraising event through both personal interactions and use of fundraising webpage. Independently raised over $500 each year of participation. Set up and manned registration and refreshment tables on race day. Taught basic swimming skills to children ages 5 through 13. Created fun swimming games and exercises; evaluated and conveyed student progress to parents. Here are resume writing tips for high school students to use to be sure you have included all your relevant skills. You might also include some of your skills, and examples of times you demonstrated your skills, in your cover letter. You may not be able to work all the skills you have into your resume, but keep a list of your top five skills related to the job for which you are applying in mind when you interview. You'll be able to mention them when you're answering interview questions about why you're qualified for the job. Try to work those skills into the conversation. The closer a match you are to the job requirements, the better your chance of getting hired.